1. I think we're slowly figuring out a rhythm to these weeks. I still want to tweak our frenetic, hectic weekends a bit, and I've worked toward that end some this week. I'm hoping things won't feel quite so frantic in the short hours between Friday evening and Sunday afternoon. There's a lot to do, and if I can minimize what we actually do, all the better. One thing, I have a feeling we'll be having wings this week (I managed to get out of it last weekend!). 2. I think one of the highlights of my week was getting a text from a friend on Thursday to say that she was in the gallery of the VA Senate (she was visiting to lobby on some legislative issues that are important to her) looking down on Cal! How cool is that?! Even better was pulling up the feed of the session and seeing her and her group introduced. 3. I think I can't underestimate the importance, or value really, of good quality bath products. My skin is so unhappy this winter. I've been so grateful for my Santa Maria Novella hand cream, and I've been slathering it on like it's Nutella I'm saving for a snack for later. My mom got me some L'Occitane bath foam for Christmas, and that's been a life saver too. Especially on headache days. It is so nice and scented and just... lovely. I never, ever, ever treat myself to stuff like this, but the truth is the quality is leaps and bounds above drug store products, so maybe I should. 4. I think I can't believe that our desktop is positioned in the coldest corner of our house. My toes are frozen, all my muscles are tight from trying not to shiver and my mouse-moving hand is shaped like a perma-claw. Even Violet has abandoned her perch at my feet for the bed by the radiator. All that being said, I'm thinking about switching to a stand-up desk with a stool for when I get oh, so weary. But they're so ugly. Anyone have a bead on some pretty ones? 5. I think this lemon, pictured above, is our favorite harvest from last summer's garden. We birthed a lemon! In January! Our first year with the Meyer Lemon Tree (dwarf) wasn't meant to yield any fruit (maybe if I lower my expectations for my son, he'll get into Stanford NEXT YEAR), but after some lovely fragrant blossoms, we got the little lemon that could. It kept growing and growing, and when it got cold outside we brought it in, hoping it would ripen. Neel harvested it last weekend, and this weekend I want to make something lovely with it. Something lemony. 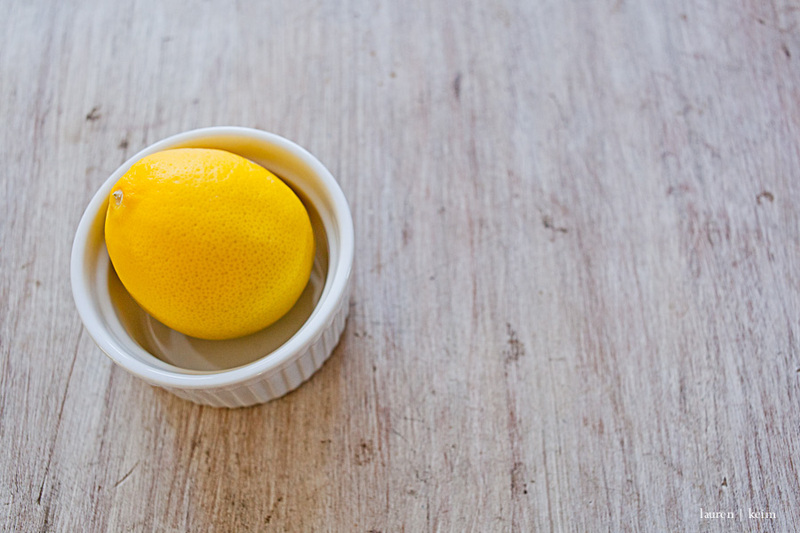 I'm leaning toward something that takes just one lemon so we can showcase this sweetie. Any suggestions?